No Facebook, and no You Tube. For two weeks! Not that I am addicted to either but it came as a real surprise. I thought Syria was opening up. Lucky I didn’t have much time for either. 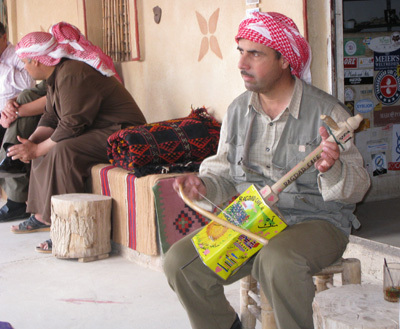 I had two groups, one after the other, the first with several food writers, all listed now in the Baghdad Cafés guest book — the café is a delightful stop on the way to Palmyra where you can listen to the owner play wonderful music on a funny tin string instrument. I won’t describe all that we did during these two weeks but I thought I’d tell you about some of the highlights. 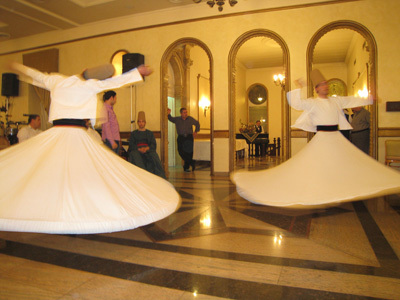 The most exciting, at least for me, was our second dinner at the Club d’Alep where we watched three whirling dervishes dance. We were lucky. We happened to be there at the same time as members of the Académie de la Gastronomie Libanaise and my friends at the Académie Syrienne de la Gastronomie had laid on the show for them. 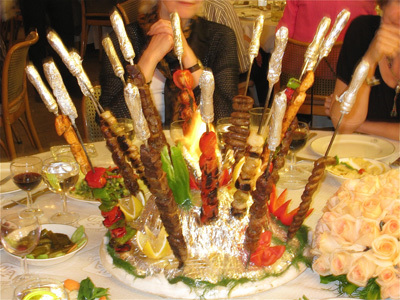 They had also ordered, as a main course, the pièce de resistance of the club: a selection of shish kebabs, served spiked into a glittering serving platter in the middle of which is a real fire. Quite spectacular. Sadly, we missed the breakfast at Maison Poche, a fabulous European flat in a caravanserai in the heart of the old souk of Aleppo — we had to leave early for Apamée and Krak des Chevaliers and we couldn’t fit it in. 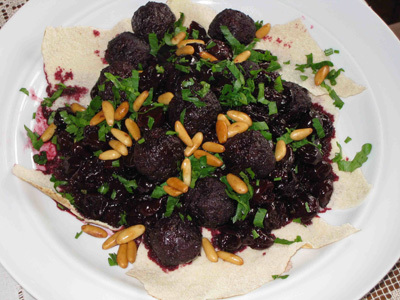 But before that, we had a great day at Maria’s, a rare Syrian woman chef, who does cookery demonstrations for my groups in her house, showing how to prepare various Aleppine specialities, including cherry kababs (see recipe below), one of the city’s signature dishes. 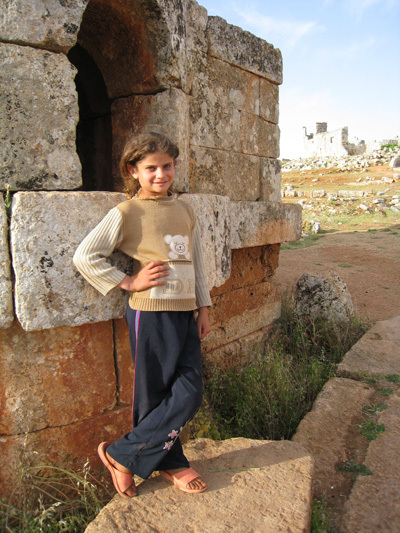 The cherry kababs were delicious, but even more delicious was the young beauty I found in Serjilla, a fabulous dead Byzantine city south of Aleppo. We went there after Qal’at Sem’an (St Simeon) with possibly the most irritating guide ever who kept complimenting me on my newly acquired amber & gold worry beads hoping that, in good Arab fashion, I would give them to him. No such luck. 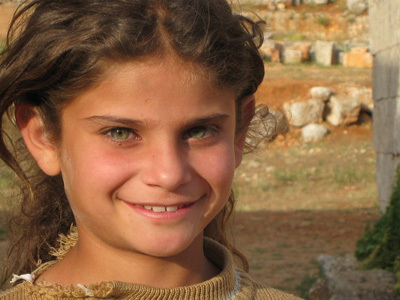 In any case, as we walked around the wonderful ruins, I came across the most beautiful child I have ever seen during my travels in Syria: blond, green-eyed and just like the models you see in magazines. Totally gorgeous, and what’s more, perfectly aware of her beauty as you can see from the way she posed for the photographs. I wanted to do a Madonna and adopt her on the spot but she said she was happy with her family. So, I gave her and her brothers money. The elder brother immediately swiped her share. I tried to return it to her but she wasn’t too worried. She assured me he would save it for her. Not so sure. I will find out when I am back there in the autumn, and perhaps I will ask her again if she wants to move to London. I am not entirely serious! Cherry Kababs Kabab bil-Karaz If there is a dish that symbolises the cooking of Aleppo, this has to be it. There are several versions. Maria grinds the cherries before cooking them while my friends Lena Toutounji, who has one of the best tables in Aleppo, and May Mamarbachi, the creator of the first boutique hotel in Damascus, the wonderful Beit Mamlouka, both leave the cherries whole. Maya very kindly gave me cherries from her frozen stock so that I could test the recipe. I am not sure if fresh sour cherries are available in the US but Jeffrey Steingarten, who was with me on a previous trip to Syria when Maria demonstrated the dish, declared that the Syrian sour cherries were the same as those you buy dried in the states. If you can’t get them fresh, simply soak dried ones as indicated below and use as with fresh ones. Serves 4 For the meatballs (kabab) 1 lb minced lamb ½ tbsp sea salt ½ teaspoon 7-spice mixture (or allspice) 1 tbsp unsalted butter For the cherry sauce 2 lb fresh sour cherries, pitted (or 1 lb dried sour cherries soaked overnight in 2 cups water) 1 tbsp sugar 1 tbsp pomegranate syrup To finish 2 tbsp unsalted butter, 2 to 3 pita breads, opened at the seams and cut into medium sized triangles ground allspice 3 tbsp finely chopped parsley 4 tbsp pine nuts 1. Mix the meat with the salt and spice mixture (or allspice) and shape into small balls, the size of large marbles. Melt the butter in a large frying pan over medium heat and sauté the meatballs until lightly browned. 2. Put the cherries, sugar and pomegranate syrup in a saucepan large enough to eventually take the meatballs and place over medium heat. Bring to the boil, then reduce the heat to medium low and simmer for 15 minutes. Add the meatballs and simmer for another 15 minutes. 3. Melt half the butter in a small frying pan over medium heat. Add the pine nuts and sauté, stirring constantly, until lightly golden. Be sure not to burn them. 4. To assemble the dish: spread the pita bread all over the serving platter, coarse side up and making sure the pointed ends are nicely arranged on the outside. Melt the remaining butter and drizzle all over the bread. Sprinkle with a little allspice. Spoon the meat and sauce all over the bread. Sprinkle the chopped parsley all over, then the sautéed pine nuts. Serve immediately. 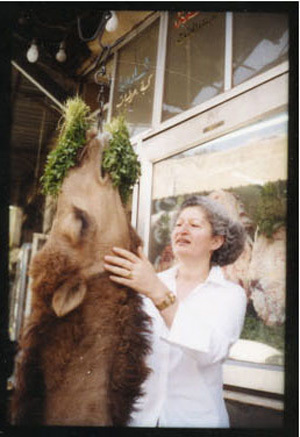 It was a pretty gruesome, although irresistible shop sign: a camel’s head, dripping blood and hanging from a hook right on the street outside a butcher shop. And I almost knocked into it — I did stroke another less bloody head later. I had never seen anything like it before. 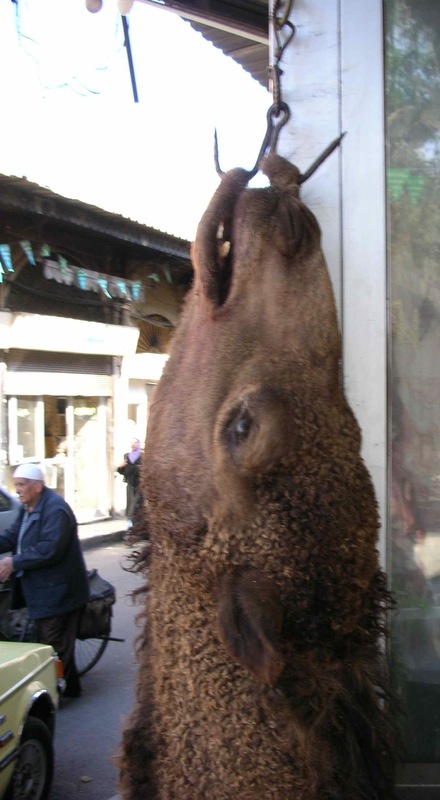 I went in to ask why the head was hanging outside, and the butcher explained it was to show that he specialised in camel meat. I had never tasted camel meat before and here was my chance. 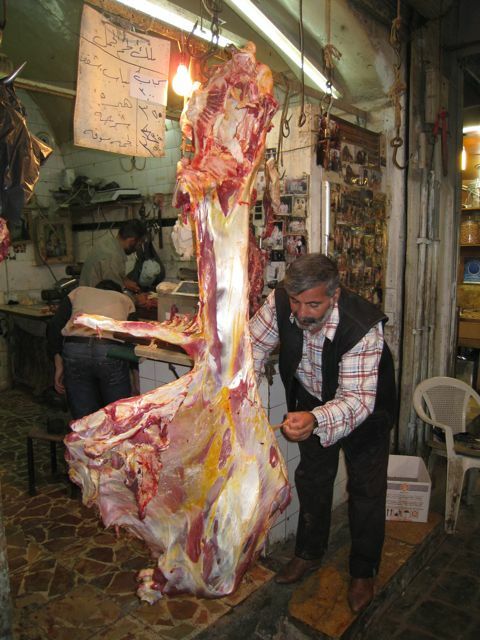 Most popular Syrian butchers — I was in Midan, a popular food shopping area in Damascus — have a charcoal grill inside their stall/shop with a counter or a couple ofÂ tables to serve grilled meat to passing diners. I was with my mother and if you knew her, you would understand why it was difficult for me to convince her to sit at the butcher’s table while he cooked my camel kebabs. 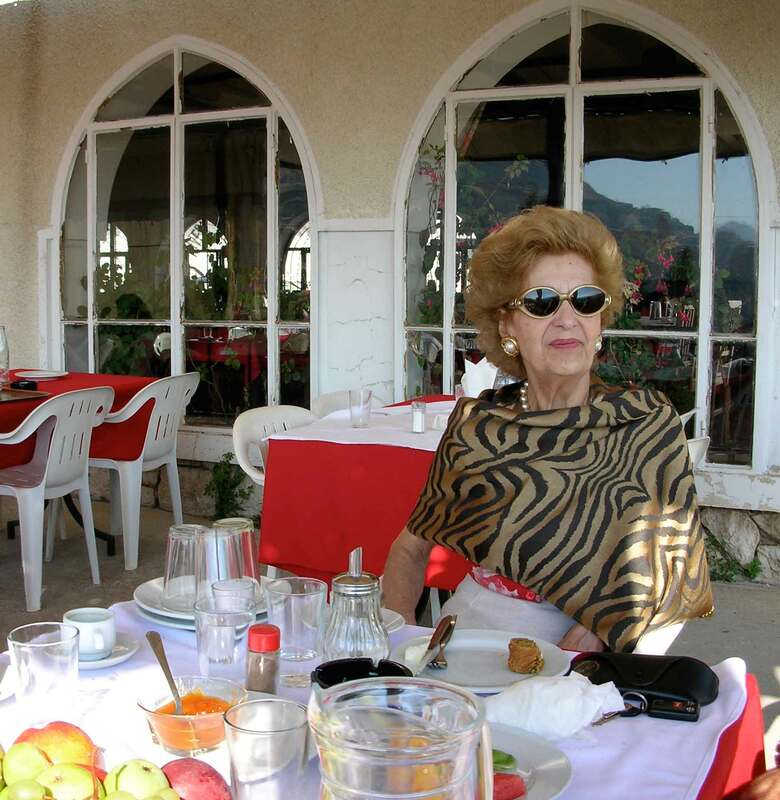 Here is a picture of her at the end of a wonderful meal in B’charreh, Lebanon where we feasted on goat’s kibbeh nayeh (raw kibbeh). It should explain why street food is not quite her thing. In any case, I insisted and being the good mother she is, she relented and followed me into the shop. I ordered my kebabs (also some for my mother despite her protestations) thinking he was going to cut the meat in pieces and thread them onto skewers; but when I saw the butcher starting to mince the meat, I asked him why. 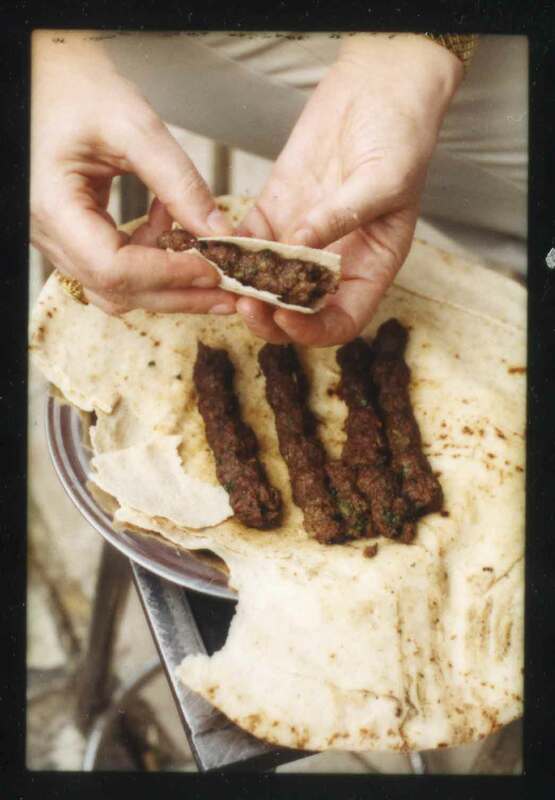 His answer was that this was what I had ordered –Â kebab or kabab in Syria means minced meat, either en brochettes, or shaped into balls and stewed in different sauces with either fruit or vegetables. He added that camel meat was too tough to grill in pieces. So, I let him mince the meat, shape it around the skewers and grill it for us. By then, my mother had relaxed and was happy to share my kebabs. And I must say, the meat was not that much different from lamb, a little drier perhaps and gamier. Much later I learned from Ahmed, my wonderful driver in Aleppo, that all good Muslims must eat camel meat at least once a year. Why? Because camels, unlike most animals, are faithful. They don’t allow their camel wives to be seduced by other camels! Didn’t double check on that but I am prepared to believe him. Here are a few more pics, the one below and the last taken by Ben who was with me in Damascus on another trip and whose pictures are featured in the Food & Wine article. The following photographs are mine, taken in the souks of Aleppo, very near Bab Antaki. 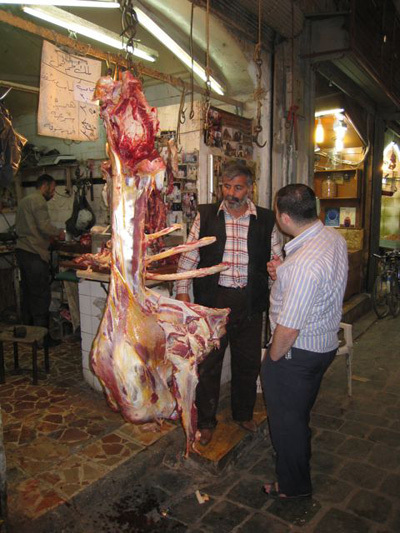 The guy talking to the butcher is discussing which cut to buy and the guy in the background is manning the charcoal grill; and the photographs on the board behind him are all of camels when they were alive. 1 – Put the onion and parsley in a blender and process until finely chopped. Transfer to a mixing bowl, add the ground meat and seasonings and mix with you hands until well blended. Pinch a little off and sear in a hot pan to taste. Adjust the seasoning if necessary then divide the meat into 12 equal portions. 2 – Pre-heat the broiler to high or start a charcoal fire. 3 – Roll each portion of meat into a ball. Put one in the palm of your hand, take a long skewer, preferably a flat one as the meat will hold better onto it, and start wrapping the meat around the skewer, squeezing it upwards, then downwards to bind it around the skewer in the shape of a long sausage. Taper the ends and place on a rack ready to grill or broil. Do the rest of the meat in the same way. 4 – Cook the meat for 2-3 minutes on each side or until the meat is done to your liking. Serve hot with pita bread. For years I made m’hanncha with the same dough as that for cornes de gazelle and with the same filling, just shaping it differently. 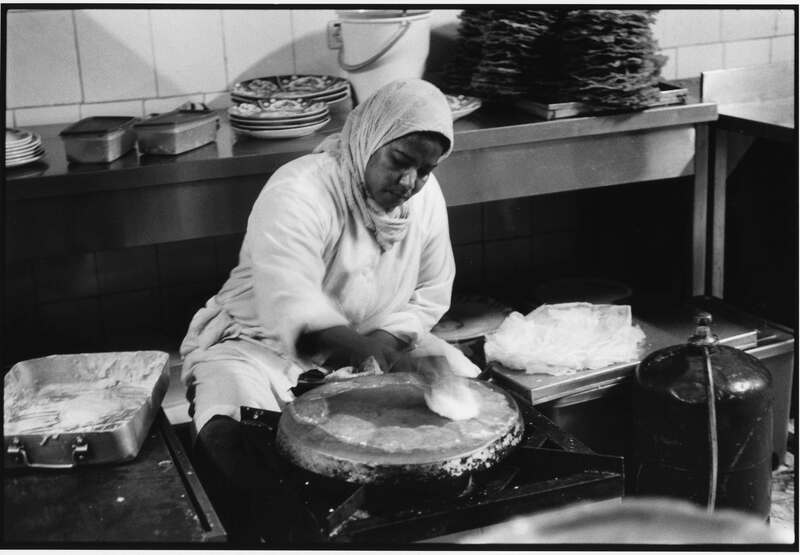 Until I met Bushra, a wonderful Moroccan cook who helped me in my classes in Marrakesh. One day I was teaching how to make cornes de gazelle and said to the students that they could make m’hanncha with the same dough and filling. Bushra corrected me and explained that m’hanncha was indeed made with the same filling but that the pastry used was warqa and not the dough for the cornes. Much easier I thought except that I couldn’t find the same super-thin, super-pliable warqa in London. I started bringing back a stock of warqa with me whenever I went to Morocco and kept it in my freezer. Unfortunately,Â I had to throw away my last batch. A friend left my freezer door open one evening, ruining a whole stock of mango ice cream (my own), a beautiful foie de canard, which I had brought back from Paris and a sizeable stock of warqa, which I had bought from the best woman warqa maker in Marrakesh. Too sad. So, I had to make do with filo recently when I taught a Moroccan class in which I showed everyone how to make m’hanncha. It worked well as you can see from the pic below, although the snapshot is not my best effort. At least it gives you an idea. Here is the recipe, and before it a few photos I took in the kitchens of my favourite restaurant in Marrakesh, Stylia, showing how warqa is made. 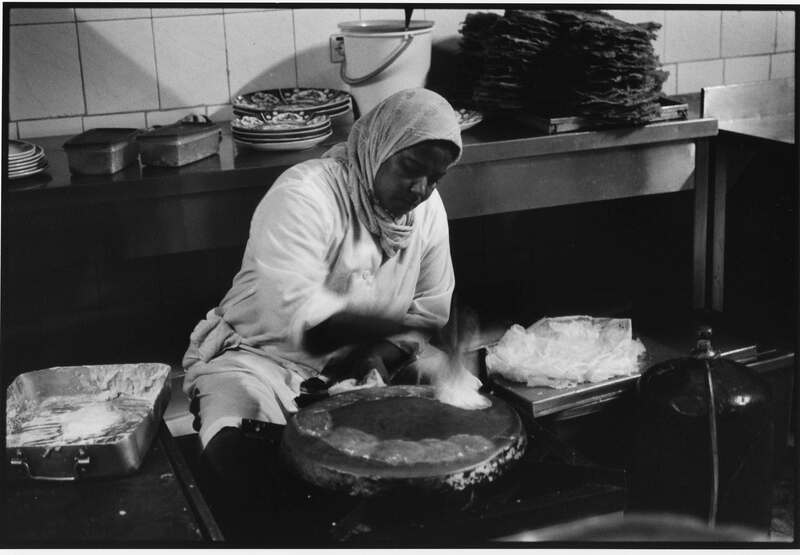 The dough is very, very wet and the woman bounces it very quickly like a yo-yo, all around a hot tobsil (the metal plate on which warqa is cooked). 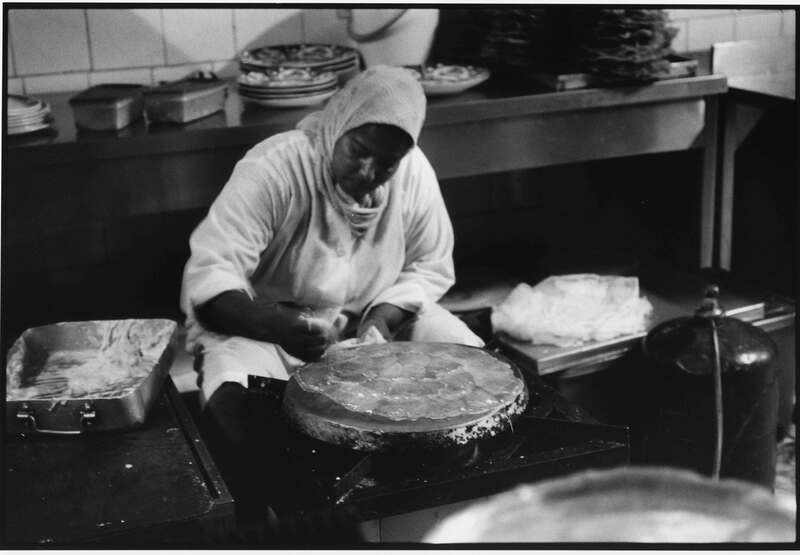 Each time she releases the dough, it hits the hot tobsil (metal plate on which warqa is cooked), leaving a thin disk of pastry. She makes sure each disk slightly overlaps the other, until she has an outside ring. She then starts the same process again, inside the first ring, slightly overlapping the outer ring, and carries on until she covers the tobsil. 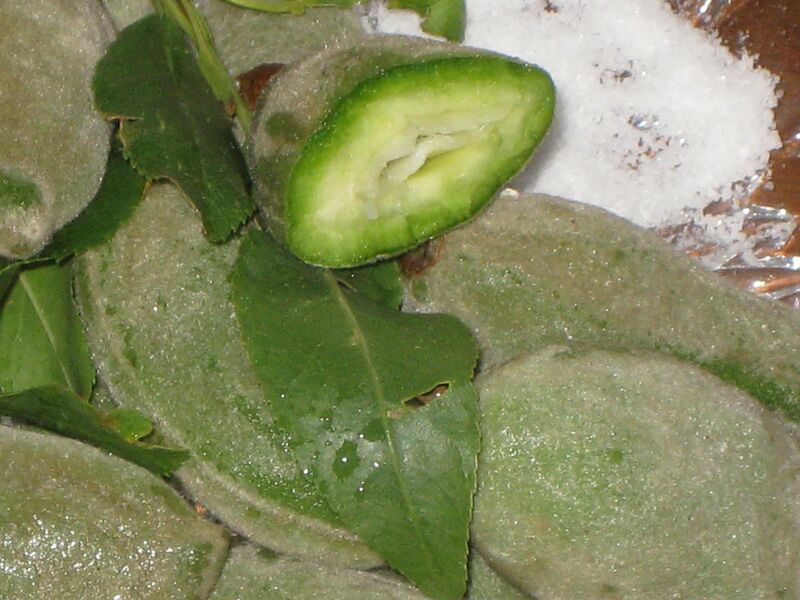 She then peels off the thin warqa (meaning leaf in Arabic, although in Tunisia warqa is known as malsuqa meaning stuck) and stacks it over the previous ones. The sheets are slightly oiled. Totally different from anything you buy outside, either in France, England, the US or wherever, and much easier to work with than either commercial warqa or filo. 1.Â Drain the almonds well and put together with the icing sugar in a food processor. Process until pretty fine, then add the butter, mastic and orange blossom water. Transfer to a mixing bowl and roll into a ball. Divide into 20 equal pieces and roll each into a ball, before rolling into a long, thin sausage. Cover with cling film. 2. Preheat the oven to 200Âº C.
3. Lay one sheet ofÂ filo on your work surface and brush with butter. Lay one almond sausage, about 1 cm away from the edge nearest to you, leaving about 2 cm on either end. Flap the filo over the almond sausage and roll, keeping the filo very close to the almond throughout. Brush with butter all over and with the seam side down, fold the empty end over the almond roll and roll into a coil, sliding the other empty end under the coil. Transfer to a non-stick pan and press lightly on the coil to make sure it doesnâ€™t unroll during baking. Make the remaining spirals the same way. When you have finished them, spike them here and there with a toothpick to stop the pastry from puffing. 4. Bake in the preheated oven for 25 minutes or until golden brown. Let cool on a wire rack. Serve at room temperature or store in a hermetically sealed container where they will keep for a few days. I have been travelling quite a lot recently. Everywhere I have been, there has been talk of the credit crunch: friends losing their job, others losing much of their investments, companies going bust and property prices plummeting. Not so in Lebanon. I have been here for a few days and the place is booming. Cranes everywhere with luxurious (and not such luxurious) buildings going up wherever you look. Bentleys, Porches, BMWs and Mercedes galore; and valet parking in just about every shop and restaurant for all the fancy cars (often seen driving right next to seriously clapped out vehicles which would not be allowed on the road anywhere else in the world. All trying to get through the most awful traffic you can imagine). 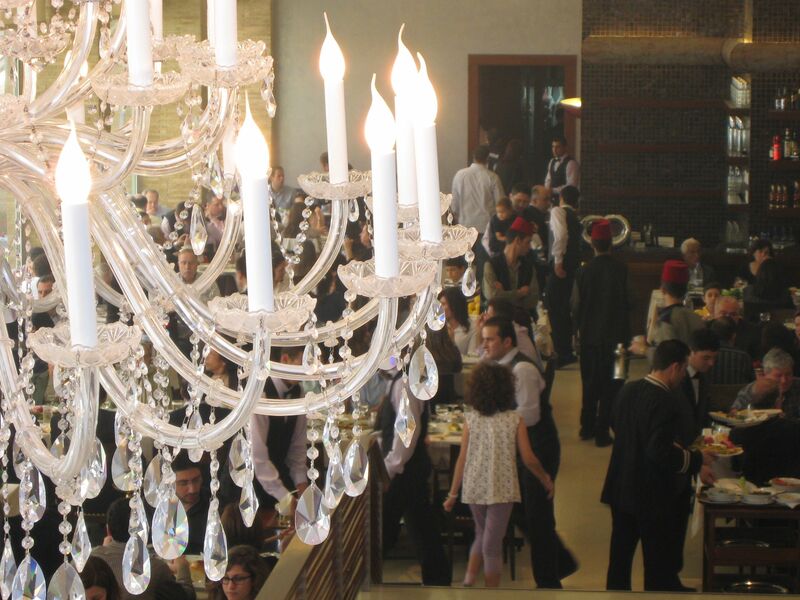 And this brazen prosperity is best show-cased in the large restaurants where Lebanese families go for Sunday lunch. This last Sunday, I went to visit my wonderful friend Reda at hisÂ house by the sea north of Beirut. We could have easily eaten on his terrace, just above the rocky beach. Saba, his housekeeper, had prepared tabbuleh with parsley from the garden and all we had to do was to order fish from the neighbouring fisherman. Am not sure why, with such a blissful setting, we decided to go out. Easier we thought. Hmm… We didn’t count on the Sunday lunch scene at fancy Lebanese restaurants, which they call casinos here. Reda lives between Paris & Beirut and I in London. I guess we forgot about that scene. In any case, we had two choices: eitherÂ Chez Zakhia or at Mhanna sur Mer, a new branch of the famous Mhanna (in Zahle, and elsewhere), and their first with an accent on fish. I had been Chez Zakhia, several times, but never to Mhanna sur Mer. So, we decided to go there despite the fact that it was fancier than either of us would have liked. Here is the view of the entrance, going down the stairs to sea level. Quite swish. 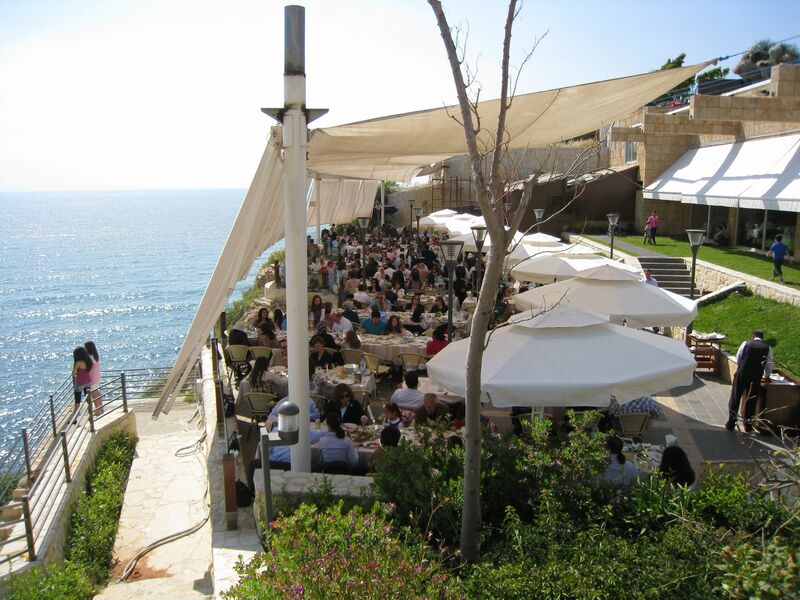 When we got there, we didn’t even ask for a table on the terrace as it was already heaving. Instead, we asked for a table by the window inside. No chance. So, we insisted on a table in the corner where we could still see the sea, and be somewhat away from the crowd. Lucky we nabbed it. The family who had booked it tried to reclaim it. Reda ignored them and hung on to the table while I was choosing the fish — Mhanna sur Mer, and all other fish restaurants for that matter, have a fresh fish display of fish for you to choose from. once you decide whcih fish you want, it is weighed, cooked to your liking and brought to your table, normally fairly quickly. The waiter immediately brought us fresh broad beans, taken out of the pod and piled on ice cubes, fresh peas (v sweet) and delicious fresh green almonds. A nice change from the regular cruditÃ©s platter. Great service, as you would expect in a Lebanese restaurant. But this was the first and last of it. After this, we were completely ignored, and when the waiter brought any food, he almost threw it at us. Highly unusual. I wondered if it was the way we were dressed: both in jeans, me in trainers and Reda in Birkenstocks, whereas the rest of the diners were all bling. 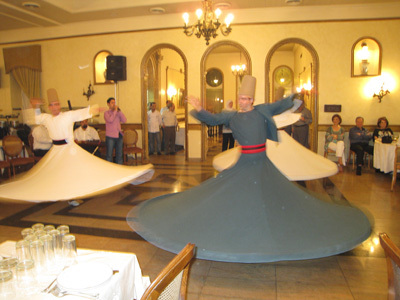 It could have been our simple appearance — in Lebanon it is all about showing off — or it could have been a question of pre-tipping. 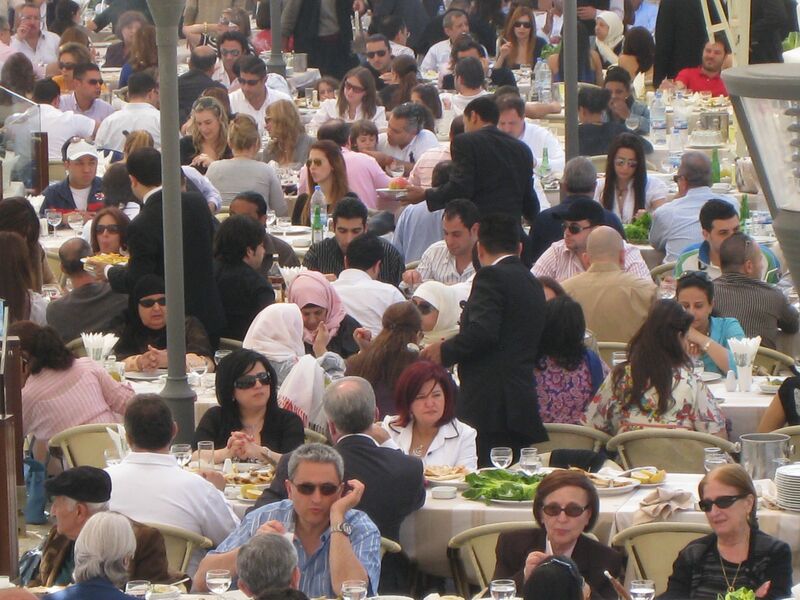 At some stage, Reda noticed our neighbour, who was presiding over a table of twelve (all the same family and four generations of it), slip the waiter a 10,000 Lebanese liras note (less than $10) which meant the waiter was theirs and no one else’s. Once that money greased the waiter’s hand, no one else existed. Neither Reda, nor me were prepared to slip him any money, as a matter of principle. He was paid and we would have tipped him handsomely at the end had he been attentive. At the end I called the waiter and in a sarcastic tone, which was completely wasted on him, I asked if he was especially assigned to the table next to us. He immediately replied: Abadan Settna, omerina (never our lady, just give the order — a respectful way of addressing middle aged ladies and older!). When I laughed and said we’d been trying to order for quite a while and not getting anywhere, he started running around trying to pay attention to us. This lasted 5 minutes! After that he went back to his patron’s table and waited on them exclusively. We finally got our food, ate it, paid and left, leaving him a paltry $3 tip. Moral of the story: never again for Sunday lunch, at least not there. I don’t remember such bad service anywhere, even on busy weekend days. 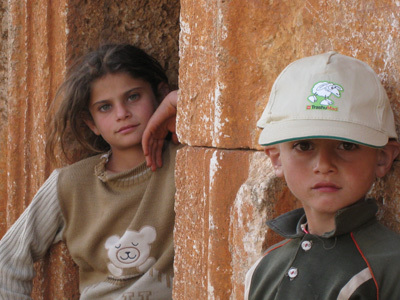 I will probably go back, on another visit to Lebanon but during the week when it is quieter. The restaurant location is divine. The fish is very fresh, and perfectly cooked. Shame about the horrible service.